Over the last few decades, a growing number of European cities have led the world in changing the direction of parking policy. European citizens grew tired of having public spaces and footpaths occupied by surface parking. 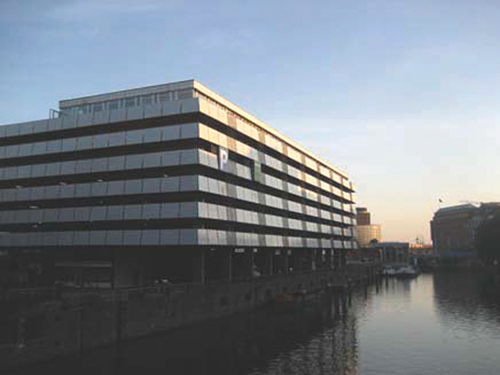 People began to question whether dedicating scarce public space to car parking was wise social policy, and whether encouraging new buildings to build parking spaces was a good idea. No matter how many new parking garages and motorways cities built, traffic congestion only grew worse. Vehicle parking consumes a lot of land, is blighting, and contributes to dispersed development, increasing travel distances. Every car trip begins and ends in a parking space, and each parking space takes up an area ranging from 15 to 30 sqmt. Car drivers need between two to five different parking spaces every day. The ample provision of parking, especially free parking, contributes to excess car use by making driving the most convenient and affordable travel option. Parking policy can be a powerful tool to encourage people to take public transport or to use cycles. It also has helped to improve the quality of city centres and surrounding areas, saving time and money for shoppers, residents, commuters, and business owners alike. Cities aiming to reduce car use also remove or restrict on-street parking in central areas, and charge a high price for the remaining spaces. European cities are ahead of the rest of the world in charging rational prices for on-street parking that leave an optimal number of spaces vacant for newcomers. This substantially reduces traffic from vehicles cruising for parking. Physical design is another important component of parking management. Because walking trips are slower than other trips, if a person can walk to his or her car faster than s/he can walk to the bus stop and catch a bus, most people will choose to drive. Some European districts, like Vauban in Freiburg, Germany, place parking at the perimeter of the neighbourhood, keeping the neighbourhood core car free but accessible by bike and public transport. Finally, many cities have begun to reduce the supply of off-street parking at locations with good public transport access. Cities at the forefront of parking reform are reducing or removing minimum off-street parking requirements and replacing them with maximums. The most innovative approaches to parking have improved the economic, social, and environmental quality of city centres. Choosing the right policies depends on a city?s goal ? whether it is to reduce CO2 emissions, to relieve traffic jams, to remove vehicles because they are a nuisance, or any number of other reasons ? and certain policies fit certain goals better than others. The following sections present some of the successful tools that European cities employ to manage parking. Economic mechanisms help ensure that personal motor vehicle users pay the full cost of the parking, promote efficient use of available parking spaces, and generate revenue that can support the expansion of sustainable transport options.
? Pricing: Traffic experts know that having 15 per cent of parking spaces unoccupied is optimal from the perspective of minimizing the time people spend cruising for parking. Many European cities set parking fees at levels that vary at different locations and different times of day to keep occupancy rates at 85 per cent. Some European cities like Strasbourg also coordinateon-street parking pricing and supply with off-street pricing and supply. These measures help ensure that more desirable parking spaces are used by those most willing to pay for the privilege of parking.
? Emissions-Based Parking Charges: Some municipalities, such as Amsterdam and about a dozen boroughs in London, have started to vary parking charges based on the CO2 emission levels of vehicles at the time of registration. The London boroughs base the price of residential parking permits on the CO2 emission standards of the driver?s vehicle. Cleaner vehicles pay a discount rate, while a higher rate applies to cars that pollute more.
? Workplace Levies: Nottingham, in the UK, recently decided to impose a tax of ?250 per year on companies for each parking space they provide for employees. The levy, which goes into effect beginning 2012, only applies to companies with over 10 parking spaces. Municipalities across the UK are considering following suit. If all the districts currently considering the levy decide to implement it, an estimated ten million drivers would be impacted, as employers would likely pass down the cost on to employees. Other cities like Hamburg are allowing companies to provide fewer parking spaces than required by zoning regulations if they provide a monthly public transport pass to employees.
? Earmarking/Ring Fencing: Revenue generated from parking fees goes to support sustainable transport goals. Barcelona, Strasbourg, and certain boroughs in London funnel revenue from parking fees to sustainable transport projects rather than putting the money into a general fund. Political buy-in can be earned with this type of initiative because the public sees how money from parking charges is spent. In Barcelona, 100 per cent of parking fees go to support Bicing, the city?s bike sharing programme. Tightening the valve on driving through parking reform means embracing innovations such as pay-by-phone services, revenue earmarking, and effective public-private partnerships. Favouring alternatives to car travel means developing a restrictive parking policy that uses financial, legal, physical, and technological measures. The net result is a more balanced and efficient transport network with less emphasis on driving. Good physical design ensures that parking does not encroach on spaces that are meant for pedestrians, cyclists, and other traffic movement.
? Bollards: Many cities install bollards to prevent cars from parking in pedestrian paths and in public plazas. The safety hazards caused by vehicles encroaching on walkways and bike paths can be avoided by erecting physical obstructions. Since 2001, Paris has invested approximately ?15 million to install nearly 335,000 bollards. Bollards are also ubiquitous on the narrow streets of Madrid to prevent cars from blocking building entrances and sidewalks. These may be automated and retract into the ground to allow limited access to certain vehicles, such as delivery vans, at certain times.
? Striped Lines: Stockholm uses painted lines to mark reserved spaces for vehicles with disability privileges. Individual spaces were once marked for all vehicles, but now this is only done for special cases. Entire sections of kerbside are demarcated with one large box sometimes taking up an entire street. One large box encourages smaller vehicles to squeeze into the limited space. In this way, the city optimises revenue from its pricing program.
? Repurposing Public Spaces: Copenhagen has transformed its city centre by creating high-quality pedestrian districts and high-quality bicycle paths through the elimination of hundreds of parking spaces. Danes can be seen riding their bikes and lingering in public spaces on the coldest, snowiest days of the year. As the urban planner Jan Gehl has remarked, Copenhagen eliminated winter in just 40 years. Removal of on-street parking from historic districts and central shopping streets has become a signature feature of many European cities. This is often a boon for business, too: shops within the pedestrian precincts generate more income than those outside. Treating street space as a valuable public asset by reclaiming it from cars can lead to much better land uses. Reducing the number of on-street car parking can be a way to encourage the use of other modes by transforming former spaces to cycle paths or wider walkways.
? Street Geometry: Strategically arranging existing parking spaces can help make other street users more comfortable. In Zurich, alternating parking spaces on two sides of a narrow street act as a chicane that slows vehicle speeds. Amsterdam has zones called woonerfs that use parked cars to create a winding passage that forces vehicles to move at a pedestrian?s pace. 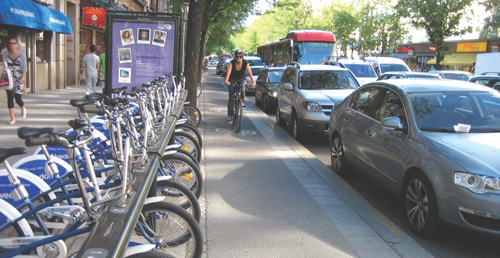 Paris and Copenhagen have bike lanes that are protected by parked cars, which act as a barrier between the cyclists and moving traffic. Copenhagen and Antwerp have play-streets that allow children to safely spend time on the street without the threat of getting hit by a car?trees, benches, and other physical obstructions cue vehicles that they are guests in the space.